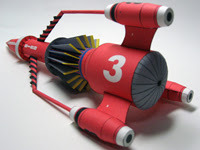 The Thunderbird 3 spaceship is out at ijoy's papercraft site. The instruction for this will come out soon. You should also check out the older models like Thunderbird 2 aircraft and pod, Thunderbird 4 and the mole and the mole and recovery vehicles.